Sat., Feb. 9, 2019, 11:47 p.m.
WACO, Texas – Kalani Brown scored a season-high 32 points on 11-of-12 shooting and No. 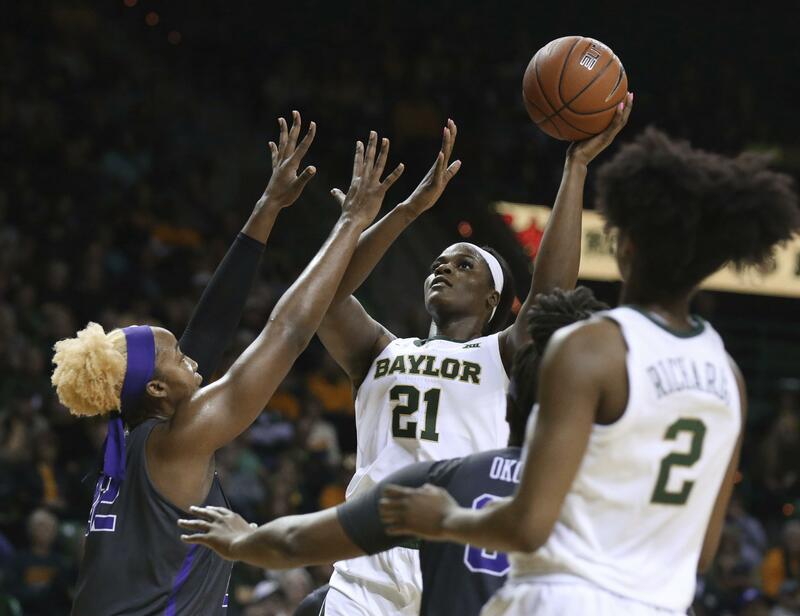 1 Baylor stretched its Big 12 winning streak to 34 in a row with an 89-71 victory over TCU on Saturday. STORRS, Conn. – Napheesa Collier tied a season-high with 30 points and grabbed 14 rebounds on Saturday, leading No. 5 UConn to a 109-74 rout of Temple. Collier, who had 30 points in a win over the Owls last month, recorded her 12th double-double of the season and 36th of her career. She hit 12 of her 16 shots, dished out six assists and blocked three shots. Crystal Dangerfield added 22 points and nine assists for UConn (21-2, 10-0 American), which tuned up for Monday’s meeting with No. 12 South Carolina by shooting 63 percent and breaking the 100-point barrier for a second straight game. Mia Davis had 20 points and nine rebounds for Temple (8-15, 4-6 American), which lost for the first time in five games. PORTLAND, Ore. – Zykera Rice had 14 points and Laura Stockton scored 13 to help Gonzaga beat Portland and extend its win streak to six games. Jill Townsend added 12 points while Katie Campbell and Louise Forsyth each scored 11 points for Gonzaga. The Bulldogs (22-2, 11-1 West Coast Conference) shot a season-high 60.3 percent from the field, including 20 of 29 (71.4 percent) in the second half. Julie Spencer hit a jumper to give the Pilots (10-13, 2-10) a 10-4 lead but they missed their next nine shots and scored just one point over the next nine minutes, 40 seconds as Gonzaga used a 19-1 run to make it 23-11 early in the second quarter. Maddie Muhlheim hit a 3-pointer that trimmed Portland’s deficit to nine points with 3:13 left in the first half but Rice answered with a jumper to spark a 10-2 run that made it 40-23 at the break and GU led by at least 14 the rest of the way. Haylee Andrews led Portland with 17 points, and Muhlheim scored 13. Jessie Loera had a career-high 10 of Gonzaga’s 25 assists on 35 baskets. Ten different Bulldogs scored two points or more and nine had at least one assist. LAWRENCE, Kan. – Joyner Holmes matched a career-high with 22 points and Texas jumped out early and beat Kansas. The Longhorns (19-5, 9-3 Big 12) swept the season series with Kansas (12-10, 2-9) for the sixth consecutive season, and rebounded from a tough home loss to top-ranked Baylor, 74-68 on Monday night. Kylee Kopatich scored 18 points to lead the Jayhawks. AMES, Iowa – Kristin Scott scored 15 points in the third quarter, another 10 in the fourth and finished with 29 and Iowa State pulled away from West Virginia for its fourth-straight win. Published: Feb. 9, 2019, 11:47 p.m.